Bundy update: 20 Cowboys Break Fed Blockade in Nevada, Retrieve Cattle!…. On Wednesday several of supporters were assaulted by Bureau of Land Management agents. Ammon Bundy, the son of besieged Nevada rancher Cliven Bundy, told Infowars reporter David Knight today around 20 cowboys went on land claimed by the U.S. Bureau of Land Management (BLM) and retrieved cattle. Cliven Bundy and his family are currently engaged in a standoff with the BLM over a long standing refusal to acknowledge a 1993 modification to grazing rights on land that Bundy asserts has been in his family since 1870. On Saturday, hundreds of federal officials, aided by helicopters, low flying aircraft and hired cowboys, began rounding up Bundy’s cattle in northeastern Clark County. Bundy’s dispute with the feds escalated yesterday when several of his supporters were assaulted by BLM officials. The BLM is currently rounding up Bundy’s cattle in order to enforce a regulation in order to protect an endangered desert tortoise after 600,000 acres of public land was reclassified as federal property. 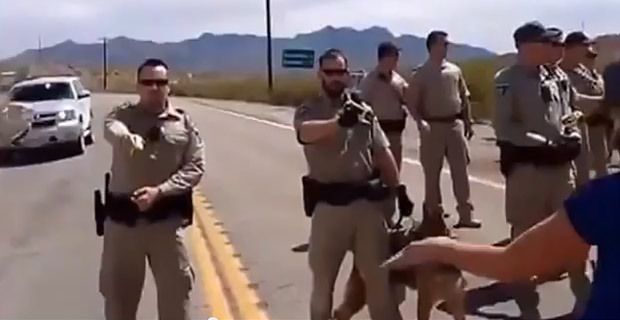 During that confrontation, Ammon Bundy, was tasered. His sister, a cancer victim, and a pregnant woman were assaulted by BLM agents. Ammon told Knight and Infowars state representatives will address demonstrators later today.